Chajnantor is a name given to a plateau in the high Atacama Desert. In the language of the region’s original inhabitants, it means something like “place of departure.” This is an apt name for the location of the world’s most powerful radio telescope, an array of detectors pushing our understanding of the universe to the dawn of planetary formation and beyond. I visited this “place of departure” on Father’s Day as part of a team of astronomy educators from around the United States. We were participating in an NSF-funded expedition to visit observatories in Chile and learn about the science being done there, as well as the importance of astronomy investment for Chilean society. Being part of this team was an incredible privilege, not simply because we were able to see instruments, landscapes, and starscapes that few ever do, but also because it was so rewarding to be in the company of such exceptional educators. 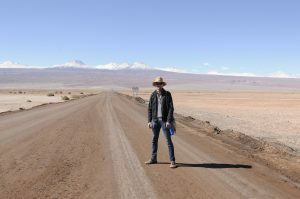 By the time we reached the town of San Pedro de Atacama, we had been together for several days and had begun to develop a better understanding of astronomy in Chile. 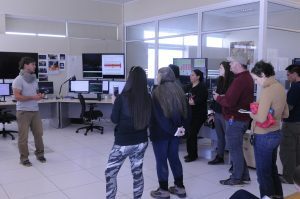 We had visited the AUI/NRAO facilities in Santiago, where we met with Chilean astronomers and educators and had workshops on science communication. 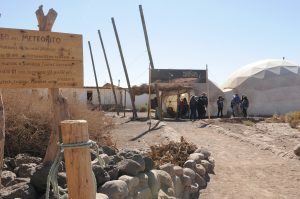 We had traveled to La Serena, spending a night at CTIO and connecting with Gemini outreach professionals at AURA. 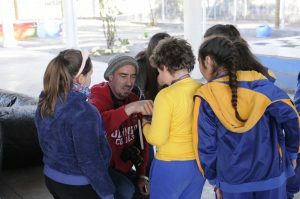 We had also been given a taste of both educational and tourist outreach in the Elqui Valley, visiting a school in the town of Vicuna with the Gemini outreach team and spending the evening at the tourist observatory Alfa Aldea, where we got our first glimpse of the southern Milky Way. 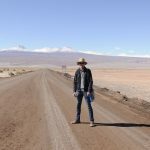 For all this though, Atacama was truly our “place of departure.” The dusty village of San Pedro de Atacama, an ecotourism hub for the desert and the closest town to the ALMA facilities, truly felt “off the grid” (though most of us still had wifi). We had a morning to wander the streets and shops under a piercing blue sky with the volcano Lincancabur looming on the horizon. Besides optimal observing conditions, the Atacama Desert is one of the best places on Earth to search for meteorites, and we visited the Museo del Meteorito, where a fraction of the museum’s immense collection is on display beneath the fabric of a geodesic dome. We learned how the makeup of meteorites reveal the processes of planetary formation in the early solar system. But San Pedro was merely the gateway to another means of investigating the processes of planetary formation. 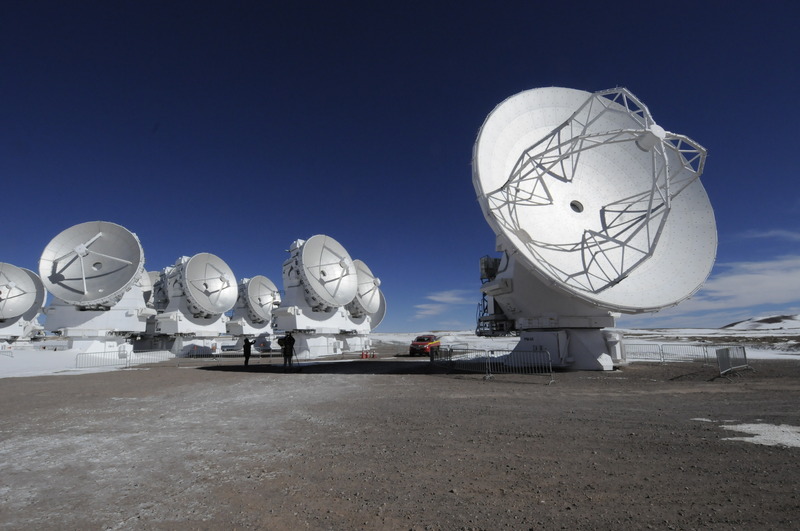 About fifteen minutes outside the town, perched on the shoulder of a wide alluvial plain sloping down from the mountains, is the ALMA Operations Support Facility (OSF), or low site. “Low” here is relative. The facility sits at an elevation of 9,500 feet—high enough that I was winded hauling my luggage inside — and an electric sign displayed the daily warning levels for UV radiation exposure. In some respects, the OSF felt like a space station: scientists and engineers working together in an alien environment high above the surface of the Earth. Here we were treated to lunch in the beautiful new dining facility, as well as a series of talks by astronomers and outreach officers on ALMA’s work and tours of the control room and laboratories. What struck me most though was the round-table discussion we had with members of the ALMA support staff on our second day at the low site. Our hosts had arranged an opportunity to dialogue with a group of electrical engineers, software engineers, and personnel supervisors—an example of the varied careers that make the entire ALMA endeavor possible. Before our conversation, I had the same unarticulated notion in the back of my head that most people share: that observatories are primarily the work of astronomers. But what our conversation helped me realize is that a facility like ALMA depends on a huge array of STEM careers. As an educator, this is something I want to carry back to my students: careers in discovery are not constrained to astronomy alone. 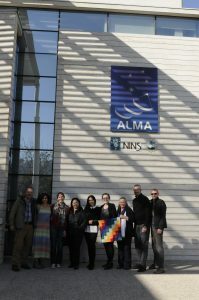 I know many young people who want to be part of the scientific endeavor at facilities like ALMA, and I want to help them understand the possibilities of pursuing a career at a place like this through careers like web developer, software engineer, electrical technician, or hardware designer—all increasingly vital components of the work being done at ALMA and elsewhere. There was another aspect of this experience I want to share as well. My city of Kankakee has a high Hispanic population, and the planetarium that I direct on my university campus is an ideal means of engaging this demographic with science outreach. Some of these students feel speaking Spanish or being Latino may be barriers to pursuing a career in science or astronomy. I want to get them excited about the United States’ investment in astronomy in Chile and show them videos and interviews of people who look and speak like them and are pursuing careers at these observatories. 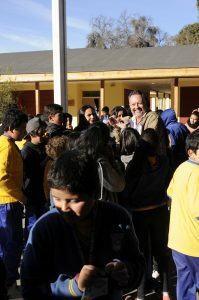 I think it would be hugely encouraging to Hispanic and Latino students to see the work of the NRAO in Latin America, and I’m working to schedule opportunities in our local schools to talk in these classrooms about my trip. The next day we ventured up the winding mountain road to the ALMA high site at 16,500 feet. Paradoxically, the landscape became more vibrant as we ascended, first with tall cactus and then with wild burro that roamed the slopes. Just beneath the snowline we saw vicuna, a sort of wild mountain llama, standing stately beside the road. Our drive ended at the Array Operations Site (AOS), the world’s second-highest metal structure. The AOS houses the world’s highest supercomputer, which calculates over a thousand baselines between sixty-six antennae, crunching the numbers of sixteen million laptop computers and allowing the whole array to function as one large radio telescope. We had truly arrived at our “place of departure,” where immense radio antennae “listen” at the top of the world for the faint signals of protoplanetary disks around young stars or the surging of matter around the black hole at the center of our own galaxy. Yet just before we ventured out of the AOS, equipped with our oxygen tanks for the high altitude, a shift of workers was arriving. We greeted some of the technicians we had talked with the day before. For us, Chajnantor was the climax of our Chilean venture, but for our new friends it was just another day on the job maintaining and supporting these incredible instruments. Stephen Case is an associate professor in the Department of Chemistry and the Geosciences at Olivet Nazarene University in Bourbonnais, Illinois, where he is also the director of the Strickler Planetarium and associate director of the university's honors program. His research focuses on the history of astronomy, and his first book, Making Stars Physical: the Astronomy of Sir John Herschel, was published in May 2018 by University of Pittsburgh Press.